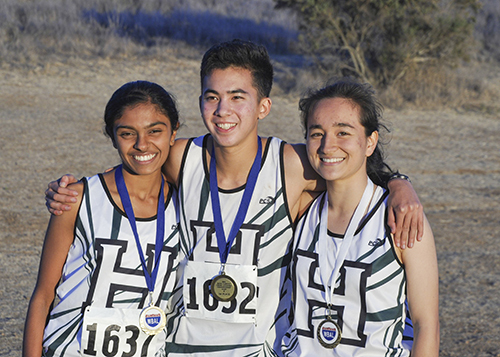 Freshman Niki Iyer became the highest-placing Harker runner ever this weekend, finishing seventh out of 207 runners in the state cross country championships in Fresno! She earned a medal by running the 5K course in 18:33. Her fantastic finish is the triumphant conclusion to a phenomenal rookie season, one that saw Iyer progressing from junior varsity to varsity, winning races and breaking records, capturing the adoration of the San Jose Mercury News, and now, finally, racking up a Harker history-making finish at state. In the race, Iyer started fast, finished her first mile in 5:28 in fourth place, and passed the second mile in fifth place en route to her seventh-place finish. She became the first Eagle runner ever on the state meet podium, winning her medal for her first team all-state status. Harker’s CCS Champion Corey Gonzales, grade 11, also competed in the state championships, finishing in the top half of the 200-runner field. Congratulations to both athletes on a spectacular, record-breaking season. Before Thanksgiving break, the girls varsity volleyball team’s playoff run ended when it was defeated by third-ranked Menlo. Harker nearly pushed Menlo to a fifth game, finally falling 21-25, 25-23, 14-25, 22-25 in the CCS semifinal contest. On Thursday, the boys basketball teams are back in action. The freshmen play Woodside at 3 p.m., while the junior varsity and varsity teams play Monta Vista, with junior varsity tipping off first at 6 p.m. followed by varsity at 7:30 p.m. Girls basketball also heads off to the Pescadero Tournament on Thursday, where they’ll play on Friday and Saturday as well.